I read Fern Britton’s New Beginnings last year but I put it down just after half way through as I was finding it a real challenge to carry on as it wasn’t gripping my attention. 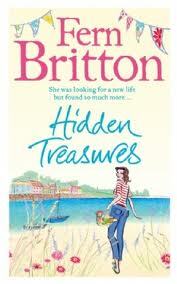 I decided to give Fern another try and so decided to read Hidden Treasures. With her children now off hand it is time for Helen to leave her cheating husband and make a new life for herself. Helen is making her new life in a quaint Cornish village of Pendruggan. Before long Helen is making a new set of quirky friends and has also caught the attention of more than one man’s eye! Thing is romance is not on the top of Helens list as she wants the chance to be free and independent. Helens best friend from London Penny, is soon heading to Penduggan to start shooting a new T.V series which also brings the help of Helen’s ex, who is intent on getting Helen back but will Helen open her heart to any of these men she has caught the attention of? I was pleasantly surprised how much I enjoyed this book I am glad I gave Fern Britton another try. The book gets off to a great cosy start and introduces us to some typical quirky country folk who were a joy to read. I really loved Simple Tony and I wish he had featured more in this book but maybe in this case less was more. If you are looking for romance this is a great read for you with a love triangle turning into a steamy love square! The author really kept us guessing when it came to who Helen would end up with, if anyone, but the big shock for me was a relationship which formed between Helen’s best friend Penny and a certain someone! I really enjoyed this book and found it very hard to put down. I did find the first half of the book was a lot better than the second half because as soon as the whole television slash fame part began in the book my attention started to waiver but it picked up again towards the end. I hope Fern’s next book will leave out any kind of fame/celebrity content as her writing is much more enjoyable when this is not included. I will be picking up another of Fern Britton’s books in future as I enjoyed this one even though I was a little hesitant to read another one of the author’s books, but this is a pleasant read one that is worth picking up.